Woohoo! We’re famous! Weinoo gave us a great write up on Gael Greene’s blog. We are in the Travel Section, and it even mentions my focaccia! Scroll down to the bottom of the article for a picture of Montone and the review of Erba Luna Ristorante. Thank you Weinoo!! Funny thing about bread, it touches some primal chord. The bread found in Umbria and Tuscany is usually the salt less variety, and it’s an acquired taste. Some people find it more useful as a doorstop than as something you would willingly put into your mouth, but over the years, I’ve come to understand the appeal of this uniquely flavorless bread. 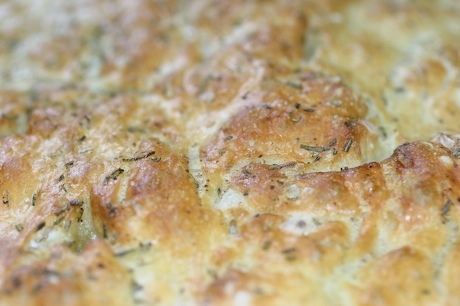 I started making focaccia at the restaurant, but only on weekends, then I had to start making it every dinner, then twice a day. It stunned me how popular the bread became. People would ask for the recipe, or ask if I could I give a bread baking class. Focaccia is simple, it’s the ultimate no knead bread. fine dust and be easy to incorporate into the dough. refrigerator. Leave in the refrigerator overnight (minimum 12 hours). This ‘retarding’ of the yeast is what will develop the flavor. and let rise for about 2 to 3 hours. attempt to bake in it. the bread, not overwhelm it. 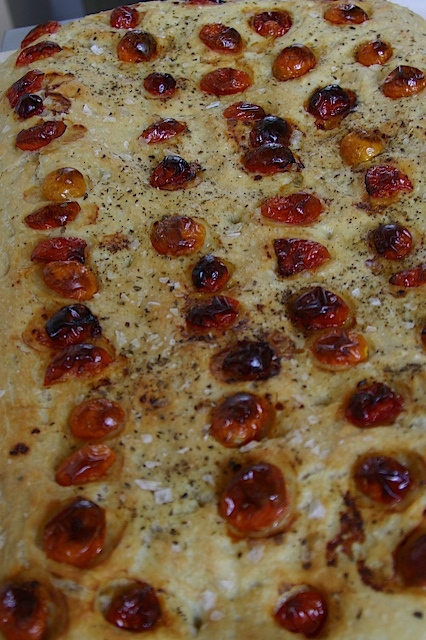 then with using finger, poke lots and lots of dents into the focaccia. tongue, and anyway, it tastes better after its cool.